Looking at my reading log I came to realise that this is the 15th book I’ve read by Julie Kagawa. When did this happen? I don’t want to compare her series with each other because they each have different strengths and weaknesses, but overall you can clearly see her development as a writer as her stories are now much more plot driven (at least in my opinion, even though I really still miss Ash and Puck from her very first series). I don’t often make remarks on my reading during the process of it. Usually because I am too busy reading and dont’t want to interrupt the flow ... along with several other overly involved reasons. I made an exception for this one as you may have seen on Twitter last week. At one point I really had to put down the book and take a breather. I’m not a squeamish reader (as opposed to viewer that’s totally different, go figure), or at least I wouldn’t think that I am, and graphic scenes of whatever calibre wouldn’t deter me from reading on. However, there I have so far discovered two things that are really difficult for me to get through: One of them relates to things that involve eyes and the other is anything that messes with a person’s brain/mind. Maybe some deep rooted fear because I’m such a head person, who knows. So yeah, that happened ... Nevertheless, this of course couldn’t keep me from the book for long as I simply had to read on. The previous book ended on a Major Cliffhanger (note capitalisation, not a joke. I need to stop doing this to myself, otherwise medicine might soon have its first proven case of bookish cardiac arrhythmia, possibly flutter or rupture ...). and thankfully it’s resolved fairly quickly in this one. Not that this means the reader gets a break or that there is any slack in the tension. And then that twist where I had to take a short break because my brain rebelled at the thought of what was happening. I honestly don’t know if I could have read on if that had gone any longer than it did. Still gives me the shivers. And it might not even be that bad for other readers, but in my personal book this comes very close to my ultimate nightmare hell, don’t judge and I won’t hold your fear of moths against you (points if you know the book I’m referencing). The end is not a cliffhanger of the capital letter variety, but it ramps up enough tension for the final book ...which of course is another year away. Story of my (reading) life. There better not be a funeral at the beginning of that one! Now that we’ve talked about personal nightmare hells ... or at least I have, why not share some of your most beloved paradise dreams (or hells, if you really wish to do so) along with your teasers in the comments. I've not read her books before but this series is one I plan on trying. 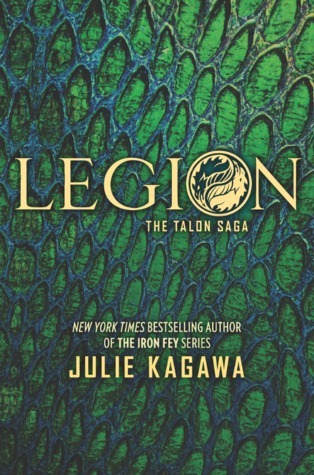 Legion sounds like a good book! I will have to put it on my TBR! The first teaser had me laughing! Sounds like some good banter between characters, always a joy to read.